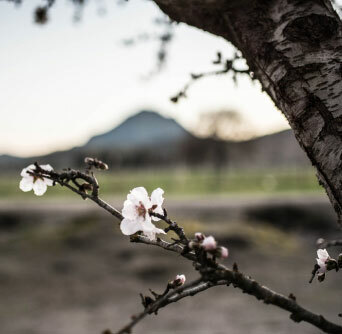 The first plum trees took root in the U.S. during the California Gold Rush when brothers Louis and Pierre Pellier brought the Petit d’Agen plum tree from France and grafted it to a wild American plum tree. Initially, farmers picked the fresh prunes by hand and dried them in the open air and sun. In 1905, a farmer brought monkeys from Panama to pick the fruit instead, with a human supervisor in tow. The monkeys were great at picking the prunes, but also enjoyed eating the fruits of their labor. Soon enough, they were replaced by humans and machines that pick the fresh prunes which are then dried in mechanical dehydrators. The prune graft is known today as the California French Prune and comprises approximately 99% of the state’s production, most of which lies within the Sacramento Valley. The rich valley soil and abundant water supply provide ideal growing conditions for high quality prunes. Prunes are grown almost entirely in the U.S., with 70 percent of the world’s supply coming from California. Approximately 100,000 tons are shipped to more than 50 countries each year. A single prune tree produces up to 300 pounds of fruit. It takes up to three pounds of prunes to make one pound of the dried fruit.